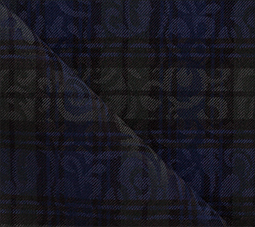 This blue and green tartan dinner jacket in characterized by a translucent paisley finish on the cloth. The jacket is constructed in a homage to 1950s black tie with a double breasted closure and large, swooping shawl lapel. The pockets and buttons are trimmed with black satin.